Beautiful ladies small double sided traditional Celtic Cross in 10k or 14k yellow gold. Handmade in Ireland. This small traditional Celtic cross is beautifully decorated on both sides (front and back) with Celtic knot work pattern. A lovely understated cross for children and young adults. Measuring 21.4mm wide and 30.6mm high, the cross is available in either 10k or 14k yellow gold. 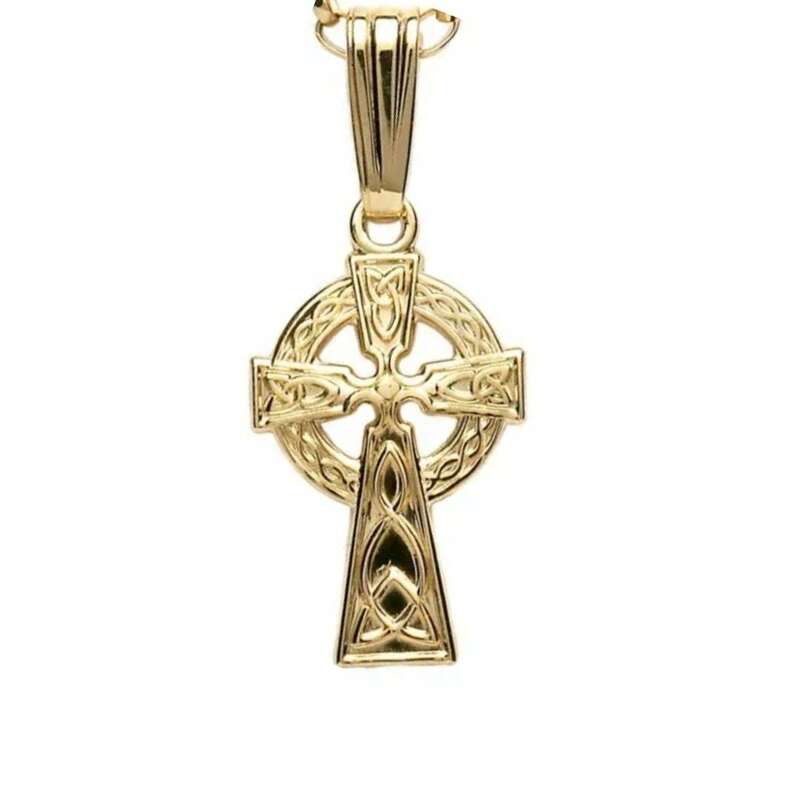 This Celtic cross pendant is handmade in Dublin and hallmarked at the Irish Assay Office in Dublin Castle and comes fitted with an 18 inch yellow gold chain. The Irish Celtic Cross has been a symbol of faith for centuries in Ireland whether the belief is pagan, Christian or another religion. However it is most widely known as a powerful symbol of Irish heritage. Originally crafted in stone Celtic crosses predate Christianity and in pagan times the circle of the cross represented the sun. It was not until the 4th century AD when it was introduced by the Roman Emperor Constantine, the Celtic cross was used to represent Christ’s victory. During the great conversion of many pagans to Christianity, Christian philosophers adapted the Celtic cross and taught the meaning of the circle to represent Christ, the center of Christianity.